Handcrafted salad fork. Sterling silver. Reeded borders and stylized rope accents. Dishwasher safe; hand washing recommended. 18/10 stainless steel salad fork. Beaded edge motif on handle. Dishwasher safe. Made in France. 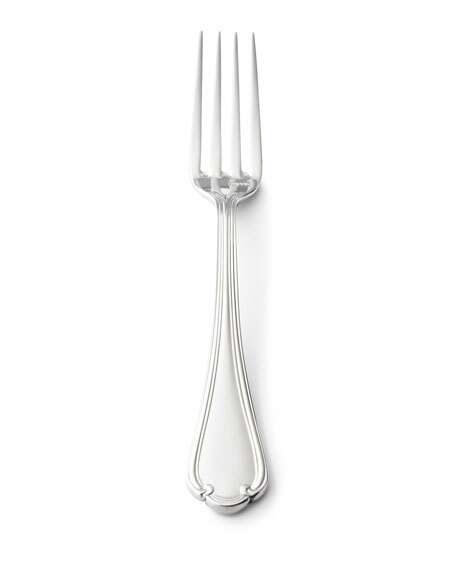 Silver-plated salad fork. Handles, spade-shaped; smooth, high-polish finish. Made in France. 19/10 stainless steel salad fork. Approx. 7.5"L. Dishwasher safe; do not use cleansers that contain citrus or abrasives. Imported.